Are you already smiling? Yep! Me too! This picture made my eyes light up, set my heart aflutter, and had my mouth watering all in .001 seconds! The soft sweet colors, striped straw, pink frosting, that retro topper of the tiny ballet dancer, and that aqua tablecloth!...swoon. Not only do I have the eye candy for you today...but also the recipe! Brought to you by the over-the-top amazingly talented Rosie of Sweetapolita! I'm honored to be able to share this recipe with you! It's a given that Rosie is an amazing baker...but when you add in her skills in photography and styling...it borders on being unfair ; ) She's living proof that all bakeries and bakers are not created equal. And I'm lucky enough to share a bit of Rosie's tastes in the sweet and sugary arts. I could seriously gush and gush. I've been a fan for a long time! You may have seen her recipes and photos popping up on pinterest...they are the ultimate in eye candy! I'd love to link up all of them for you guys but I'd be happier if you'd pop over and meet her for yourself. No need to thank me...I'm all about spreading the love! But I'd also appreciate it if I'm not blamed for any weight gain or too many trips to the grocery store for ingredients! 1. Preheat oven to 350°F (180°C). Grease, line with parchment and flour two round 8-inch pans (you will be using each one twice), or four 8-inch pans (if you’re lucky enough to have four on hand). I use Parchment Paper Circles for ease. 2. In a medium bowl or measuring cup, combine and stir the egg whites, whole egg, 1/2 cup of milk, vanilla and the almond extract. Set aside. 3. Sift cake flour twice. In the bowl of an electric mixer fitted with the paddle attachment, combine the dry ingredients, including the sugar, together on low-speed (I use the “stir” setting on my mixer) for 30 seconds. 4. Add the butter and shortening, blending on low-speed for about 30 seconds, then add remaining 1 cup of milk, and mix on low-speed until just moistened. Increase to medium speed and mix for 1 -1/2 minutes (90 seconds), but no more. 5. Scrape the sides of the bowl and begin to add the egg/milk/extract mixture in 3 separate batches; beat on medium speed for 20 seconds after each addition. 6. Pour 1/4 of your batter (~2 cups)(445 grams)(15.5 ounces) into each prepared pan (if you have 2 pans, you will bake 2 layers first followed by the remaining 2), spreading it evenly with a small offset palette knife. If possible, weigh the batter in the pans to ensure 2 even layers. 7. Bake cake layers two-at-a-time in center of oven and 2″ apart for 20 minutes or until a cake tester comes clean when inserted into the center. Be so careful to not over-bake. Check cake at 20 minutes, but not before, and once you feel it’s almost ready, set the timer for 2 minute intervals. Let cool on racks for 10 minutes before loosening the sides with a small metal spatula, and invert onto greased wire racks. Gently turn cakes back up, so the tops are up and cool completely. 8. Wash the 2 cake pans and line, grease and flour again and repeat steps 6 & 7. 9. Wrap tightly and store at room temperature for up to 2 days, refrigerator for up to 5 days, or frozen for up to 2 months. Best enjoyed day 1 or 2. 2. Add remaining ingredients and mix on low-speed for 1 minute, then on medium speed for 6 minutes. Frosting will be very light, creamy, and fluffy. 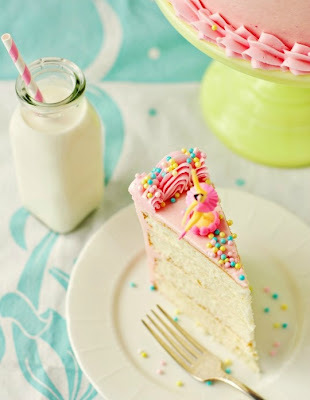 If you want all of your frosting (for filling and frosting cake) pink, then add a drop of pink gel colour and mix again, adding one drop at a time until desired pink shade is achieved (see notes). If you want just the outside of the cake pink, you will fill the cake layers first, and then colour the remaining frosting pink. 3. Best used right away (for ideal spreading consistency), but keeps well once frosted. 2. 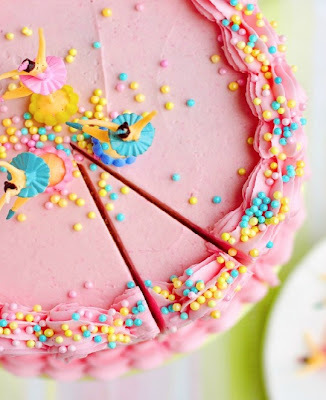 Use a cake turntable (such as this Cake Stand) for filling, frosting and decorating, if a possible. Place a small dollop of frosting in the center of a cake plate or 8″ round thin foil-covered cake board, and place the bottom cake layer on top, top side up (face up). 3. Place ~1 cup of frosting on top of the cake layer, and spread evenly with a small offset palette knife. Gently place 2nd cake layer, face up, on top. Repeat until you come to your 4th layer, which you will place face down. 4. Put a generous scoop of frosting on top, spreading evenly with a small offset palette knife and working your way down the sides until you have a thin layer of frosting over the entire cake. Chill until set, about 30 minutes. 5. Remove from refrigerator and repeat step 3. 6. For the top of the cake border, place a large star decorating tip (I used 1E) in a large Decorating Bag filled no more than 1/2 full with pink frosting. 8. For bottom border, you will want to have the cake on the plate or pedestal which you plan to serve it upon. Fill another pastry bag the same way, and this time use tip 1M and repeat step 7. You will pipe at about a 45° angle this time (give or take). Sprinkle with your favourite sugar pearls or sprinkles atop the top border. For some kitschy charm, add a few Vintage Ballerina Cupcake Toppers to your cake! 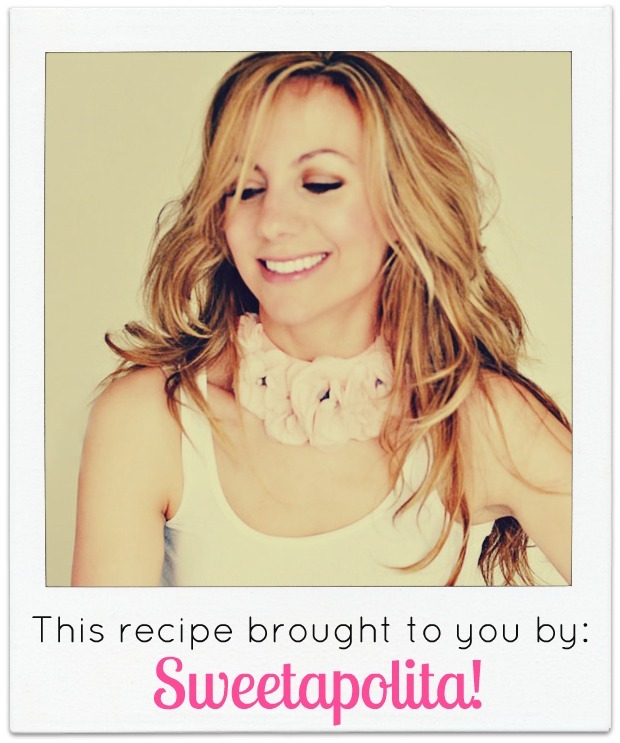 You can like Sweetapolita on facebook too! It's so pretty and looks so yummy too! Bet your family will love it! This cake looks perfect! Wow. There is absolutely no chance mine would come out looking like that... but I may still try it sometime! what a deliciously gorgeous post! and the picture... adorable! Oh man...I want some of this cake...NOW! Oh, how I want that cake! @AshleyRose Thanks for visiting!! Everything Rosie does is incredible!! So happy to share her stuff! Thanks so much for popping in!! I definitely want to try it. This looks amazing and so yummy and so pretty, but you do pretty so well! Thanks so much for sharing you doll! @cyn It's just beyond perfect isn't it? If you try the recipe..let me know how it goes! :) Thanks so much for visiting! It's perfection! I know she gave us all of the steps... but I still don't think mine would turn out as nicely... :/ My family has to kind of stick with sheet cakes because our layered cakes collapse... haha! That cake looks amazing and delicious! As a Chef I appreciate and love this blog. Ahh so beautiful! You know you're a foodie when delightful pictures of cakes make you sigh! Sweet and perfect cake for a birthday girl, young and old alike.